Now that the vegetable garden and courtyard are shaping up, it’s time to turn my attention to the front yard area. The previous homeowner was sick for a while so the front became overrun and unkempt. Not that I care to have a perfectly manicured lawn—it’s just that our house started to look like it was vacant. A plant from the old house that would look great at the new house. Perhaps I should’ve swiped it before we moved! There’s always a new discovery. In the front, I uncovered the footprint of a former flower garden. It was bricked in with landscape fabric a few inches below the soil. Unfortunately, the wild roses, ivy and other weeds had started to take over. I pulled everything up—roots, weeds and even the landscape fabric. Since I didn’t know what was a weed and what was supposed to be there (that’s all relative, isn’t it? ), I just pulled it all up, saving the mulch and putting it off to the side. Sometimes you have to pull it all out and start over. However, when watering the other day, I noticed a second row of bricks about 18 inches from the bed. A double-decker? This could make for some interesting landscaping. If you have an urge to transplant borage, just don’t. Borage is not only a great companion crop, but you can use the pretty blue flowers to make fancy ice cubes to impress your friends at your next Victorian-themed tea party, and who isn’t planning one of those? Never one for moderation, I went a little crazy planting borage seeds when I put the strawberries in the garden. And since I didn’t read the seed packet, I didn’t realize how big they’d get. One of my plants is a about 2 feet tall and 2 feet wide, and it’s just getting started. Not wanting to let good plants go to waste, I dug up a few of the plants and transplanted them to the flowerbed in the front. Epic failure! They swiftly wilted and died, and off to the compost they went. Hopefully the seeds I planted in their place will fare better. Does that grow in an Anglophile’s garden? In celebration of my husband’s roots (and mine from 400 years ago) I bought a few plants from the Co-op that I’m assured are commonly found in English cottage gardens. 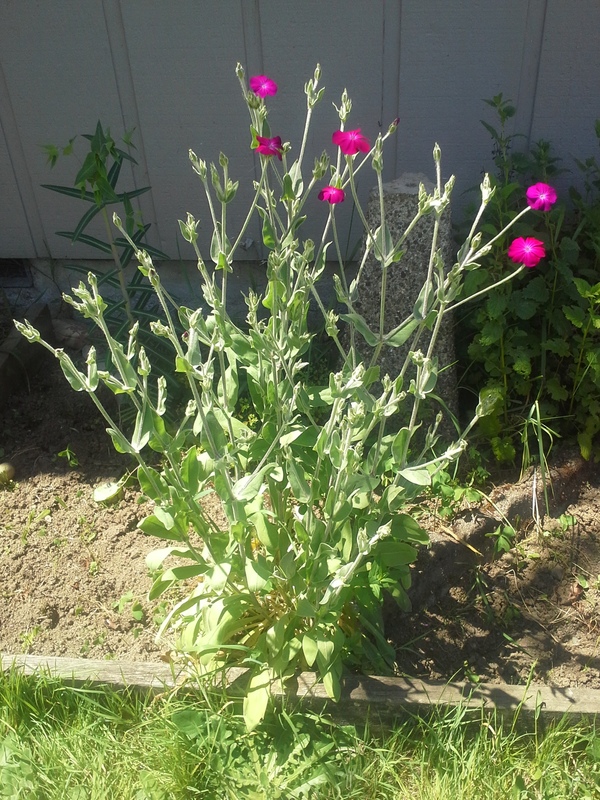 Can’t remember their names, but the tag promises that they’re drought tolerant and grow to be huge. Right now they’re about 10 inches tall and really lanky, so we’ll see if they live up to their promise. White vinegar cleans more than showers; it kills ivy, too. We have an ivy problem here—it’s everywhere. I read online that white vinegar can be used to kill it. Since I love canning, I always keep a jug or two in the house. I poured both on the ivy and rose covered redwood stump outside of my office. The ivy is gone, but the roses are like cockroaches—totally unfazed by the assault. Back to the drawing board, I guess. I’m a lumberjack and I’m okay… Last weekend, armed with a handsaw and some loppers I set out to trim the sad-looking rhododendron in the front yard. Now, I don’t know if this is the right time to prune or not, but if it’s not, I’m not sure that I have the patience to wait. It’s scraggly with parts that are dead and overgrown. I wished for Edward Scissorhands to pop over and do the work for me while I barked orders and enjoyed a refreshing fruity drink, but he must have been held up. After hacking and sawing for about an hour, I made progress, but there’s still work to be done. Another weekend, more yard work to do.